Nesting: When Will The Eggs Hatch? Question: How soon will the eggs hatch? 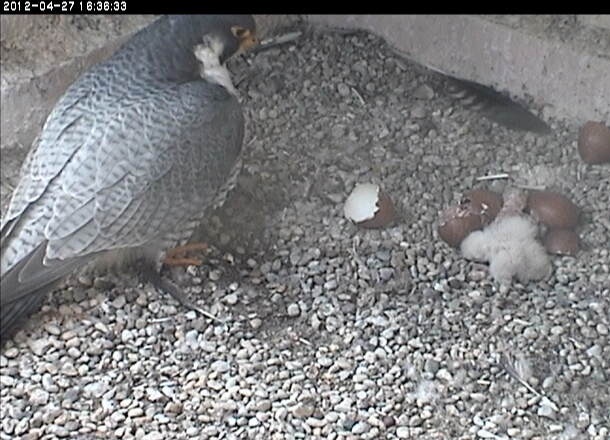 Answer: Peregrine eggs hatch about 32 days after incubation begins(*), but it is hard for most people to tell when incubation begins in earnest. I have tracked the “first egg” and ”first hatch” dates at the University of Pittsburgh and Gulf Tower nests for many years. Even though I should be calculating from the “incubation began” date, I’ve found that the average at both sites is 39 days from first egg to first hatch, though it varies a bit from year to year and nest to nest. All but one of the eggs usually hatch on the same day. The last egg is younger — it was laid 40 to 60 hours after incubation began — so it hatches that many hours later. The photo above shows hatched eggs and chicks at the University of Pittsburgh nest in 2013. The father bird, E2, is standing near the nestlings who are in a pile with the other unhatched eggs. The white fluff in the center is the first baby peregrine, already dry. The just-hatched chick is pink and wet. The scattered reddish and white bits are the discarded egg shells — outsides are red, insides are white. When the mother peregrine is covering the chicks and eggs to keep them warm, how can you tell if any of them have hatched? The big hint is a half-eggshell, discarded away from the scrape. For information on how the chick gets out of the egg, see How Do They Hatch? (*) The incubation time span used to be listed as 33-35 days. It is very hard to tell when it begins. The picture at both scrapes are much better this year than last – the new cameras make a big dfference. Do they have remote control to move them or do they have to be physically changed and adjusted ? The camera at University of Pittsburgh has zooming and autofocus capabilities. Right now it is zoomed in during incubation. It will be zoomed back out when the young birds begin to move. The zoom feature is only accessible to those who manage the camera. The camera at Gulf Tower is older and must be adjusted manually. It cannot be zoomed, but must be physically moved closer if you want a closer picture. This cannot be done during the nesting season because people are not allowed near the nest, so what you see now is what it will look like this year.